Alright, who wants long-simmered flavor in just ten minutes of pressure cooking? 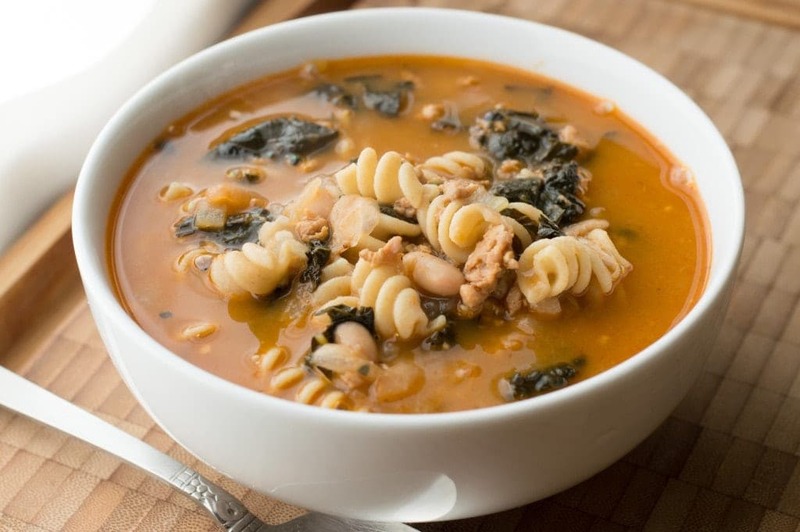 On my birthday, my gift to you is this winter-perfect, hearty soup, loaded with healthy greens and whole wheat pasta. Spoiler alert: In order to keep the noodles nice and chewy, you’ll have to cook them in a separate pot. Not to worry — a little two-quart saucepan is all that’s required to boil up a half-pound of pasta, enough to serve four. No need to break out the enormous pasta pot. 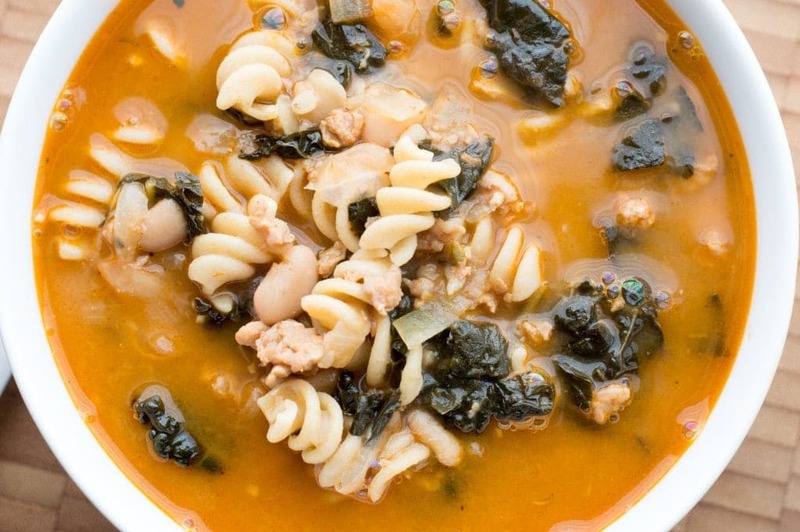 In addition to kale and pasta, we’ve got flavorful Italian sausage and plump white beans at the party. Chicken sausage has less fat and more protein than most pork versions, so that’s what I use. If you can, buy the raw kind and remove it from the casings before adding to the pot. Raw sausage imparts far more flavor to the soup than the solid, precooked variety. I used my Instant Pot to prepare this soup, which shaved a cool 20 minutes off the cooking time. If you don’t have a pressure cooker, you’ll find stovetop instructions below as well. Enjoy! A very simple soup you can make on the stovetop or in an Instant Pot pressure cooker for a hearty, weeknight meal. Add an extra twenty minutes to the recipe's time estimate if you're cooking it on the stovetop, since it will need to simmer a bit longer. Heat the olive oil in a medium (5-quart) soup pot or dutch oven over medium heat. When the oil begins to shimmer, add the onions and sauté until browned, stirring often, about 15 minutes. Add the garlic and sauté for two more minutes. Add the sausage meat to the pot, breaking it up with a spoon as it cooks. Sauté until all of the sausage is opaque and cooked through, about 5 minutes. Add the kale to the pot and sauté until wilted and reduced in volume, about two minutes. Add the tomato paste and stir into the other ingredients to break up any clumps. Add the cannellini beans and chicken broth, give the pot one more stir, then cover the pot and bring up to a boil. When the soup begins to boil, turn the heat down to low and let simmer, covered, for 30 minutes. While the soup is cooking, prepare the pasta according to package instructions. When the soup and pasta are ready, measure about 2/3 cup of cooked pasta into each serving bowl. 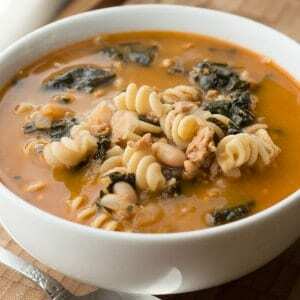 Ladle the soup over the pasta and serve hot, garnished with red pepper flakes if desired. Set the Instant Pot to “Sauté” setting and pour in the olive oil. Heat until shimmering. Add the onions and sauté until browned, stirring often, about 15 minutes. Add the garlic and sauté for two more minutes. Add the chicken broth, then cover the pot and manually set it to pressure cook on “High” setting for 10 minutes. When do you add the beans, and what kind are they (Navy? Cannellini?)? Thanks for catching that, Jo! They’re canned cannellini beans, though you can use chickpeas or kidney beans as well. Add them with the chicken broth, just before covering the pot.